BRAND NEW FORGE MOTORSPORT POLISHED RECIRCULATING REPLACEMENT VALVE & FITTING KIT. This valve is for VAG vehicles equipped with the 1.4T, 1.8T & 2.0T FSI or TFSi engines, including the latest models fitted with the IHI turbo, (or 1.4T using additional fitting kit FMBGFK3) that have the electronically controlled bypass valves. It is recommended for any vehicle where the boost pressure has been increased by an ECU software upgrade and for unmodified vehicles fitted with the earlier version of the OEM valve that operate in warmer climates, as a solution to the many failures of the diaphragm that have occurred. Our alternative is a fully engineered solution offering both significantly improved reliability. Our valve and installation kit replaces the original unit with a pressure/vacuum operated piston valve that still also retains the desirable OEM ECU control over valve actuation. This product has been thoroughly designed and tested with the expressed intent of offering improved valve response and maintaining ECU control while resulting in absolutely NO fault codes, NO check engine lights, and no adverse effects of any kind. All of the necessary components and detailed instructions are included and everything is designed to make installation as simple as possible. This will NOT fit the 2013 onwards CMBA and CXSB engines where the turbos are mounted at the rear of the engine bay. 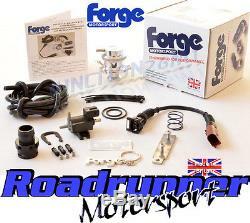 Brand New Forge Motorsport Polished Recirculating Replacement Valve & Fitting Kit. Golf MK6 GTi 2.0T TSi 210PS 09-13. In The Box: 1 x FMFSITVR Valve 1 x Wiring Harness 1 x Solenoid, Bracket, and Screws 1 x PCV Adaptor Kit 1 x Blue Spring (Uprated) 10 x Cable Ties 1 x 2000mm Length of 4mm Vac Hose 1 x Instruction Booklet 1 x Forge Keyring and Sticker. At Roadrunner we pride ourselves on our personal service that cannot be compared to any of our competitors. Our highly competent sales team are always more than willing to help, whether youre unsure of fitting specifications or just making an enquiry. All goods can be tracked to give you complete peace of mind. INCLUDES UK MAINLAND & SCOTLAND. AB10, AB31-AB39, AB40 - AB42, AB43-AB45, AB51-AB56. FK19-FK21, HS1-HS9, IV1-IV28, IV30-IV32, IV36, IV40-IV49, IV51-IV56, IV36. KA27, KA28, KW1-KW4, KW5-KW17, PA20-PA39, PA40-PA49. PA60-PA78, PH1, PH5-PH9, PH10, PH15-PH26, PH30-PH44, PH49-PH50, ZE1-ZE3. We will also send to. Northern Ireland, Southern Ireland, Highlands, Orkney, Shetland, Isle of Wight, Isle of Man. The item "Forge Recirculation Dump Valve & Kit Golf MK6 Gti 2.0 Tsi Turbo FMFSITVR Polish" is in sale since Tuesday, September 26, 2017. This item is in the category "Vehicle Parts & Accessories\Car Tuning & Styling\Engine, Tuning & Chips\Other Engine Tuning". The seller is "roadrunnermotorsport" and is located in Nottingham. This item can be shipped worldwide.